Divorce doesn't mean failure, the star stresses in a new interview. If Jennifer Aniston allowed tabloid headlines to define her, she'd be a sad character who's gone from failed relationship to failed relationship, all the while missing out on creating a family or knowing true happiness. But that narrative doesn't even come close to describing the life she's actually lived, and now the star is setting the record straight in the clearest terms possible. For instance, despite two divorces, Aniston sees her romantic past as quests for happiness — from the "I dos" to the "I don'ts." "My marriages, they’ve been very successful, in (my) personal opinion," she told Elle magazine of her five-year union with Brad Pitt and her more recent union with Justin Theroux, to whom she was married for two and a half years before they announced their split in February. "And when they came to an end, it was a choice that was made because we chose to be happy, and sometimes happiness didn’t exist within that arrangement anymore." And if she'd opted to stay in a relationship that she wasn't happy in just for the sake of being with someone, that's what she would have considered a real failure. "(T)his is our one life and I would not stay in a situation out of fear," the 49-year-old explained. "Fear of being alone. Fear of not being able to survive. To stay in a marriage based on fear feels like you’re doing your one life a disservice. When the work has been put in and it doesn’t seem that there’s an option of it working, that’s OK. That’s not a failure." And having a partner come and go without bringing a baby into the mix isn't a failure either, even though some think otherwise. 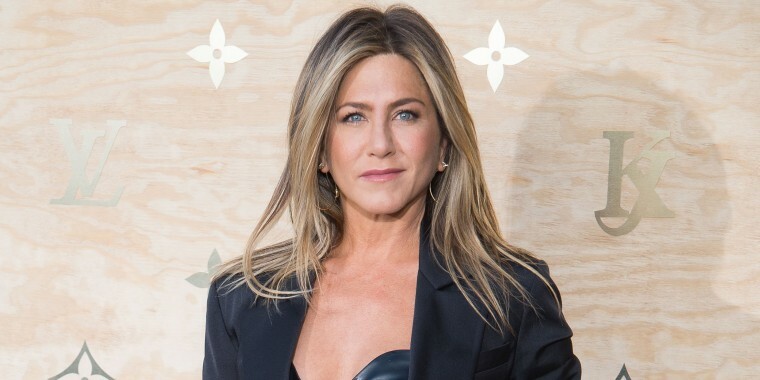 "It’s such a shallow lens that people look through," Aniston explained. "It’s the only place to point a finger at me as though it’s my damage — like it’s some sort of a scarlet letter on me that I haven’t yet procreated, or maybe won’t ever procreate." It's not something she feels she has to do. Nor it is something she's ruled out. "Who knows what the future holds in terms of a child and a partnership — how that child comes in ... or doesn’t?" she mused. "And now with science and miracles, we can do things at different times than we used to be able to." If the time is never right? Then all right. "It’s a glass-half-full kind of thing. Always being open. Allowing myself to feel what I feel," the "Dumplin'" actress said of her life. "What brings me happiness? I have a great job. I have a great family. I have great friends. I have no reason to feel otherwise."